You are here: Home / Anti-Aging / Is Rose Hip Oil Just Another Anti-Aging Fad? 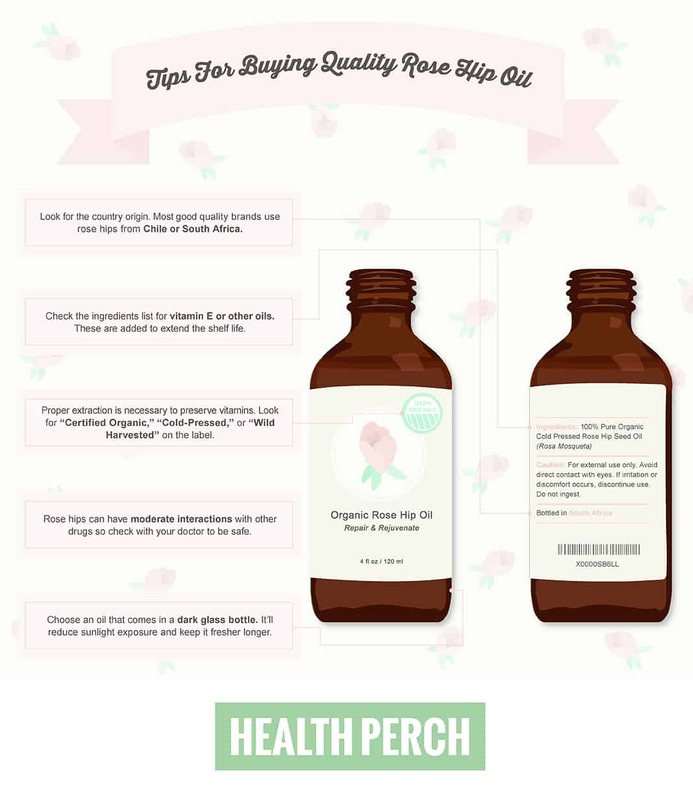 There’s a new ingredient popping up on many anti-aging product labels: rose hip oil. But this oil, extracted from the seeds of rose bushes, is nothing new: Rose hips have been cultivated for thousands of years to heal and improve skin, and for a number of other health applications. More recent research and testimonials suggest the oil provides several other potential skin benefits. Read on to discover if you should be adding rose hip oil to your medicine cabinet. What Exactly are Rose Hips? Rose hips are the seed-containing berries located below the petals, on a rose bush. The oil is created by harvesting the seeds of rose bushes (predominately found in Chile and South Africa) and then processing them through cold-press extraction or slow cooking. Cold press is considered best since drying the berries can destroy much of their beneficial vitamins. Because they contain high amounts of vitamin A, vitamin C (up to 60 times as much as an orange), and polyunsaturated fatty acids, rose hip seeds are known for their healing properties—both internally and topically. While more research needs to be done on the benefits of topical rose hip oil, one study that examined the effects of ingesting rose hip powder showed significant improvements in skin hydration, elasticity, and wrinkle reduction. Is Rose Hip Oil a Miracle Worker? Besides being beneficial to skin, rose hip oil may provide powerful health benefits. New research shows rose hip extract may reduce cancer cell growth. Research also shows that ingesting rose hip powder can improve cell longevity and reduce pain associated with arthritis inflammation. Add this to the long list of skin benefits, and rose hips may prove to be the next wonder drug. Skin gets drier with age because it produces less natural oils, but essential fatty acids can add some of that moisture back in and slow the signs of aging. Polyunsaturated fatty acids hydrate skin, which makes it appear plumper and with fewer fine lines. Rose hip’s healing properties have also been used to reduce the appearance of scars. Essential fatty acids promote skin repair and skin texture, making it especially beneficial for people who suffer from acne or eczema. Since rose hip oil is a natural antioxidant, it’s great for sensitive or itchy skin, too. The antioxidants found in rose hip oil can help protect against free radical damage (unstable molecules in the body that can speed up the aging process by damaging cells). Studies show that the damage can be controlled with a high intake of antioxidants. Should You Add Rose Hip Oil to Your Beauty Routine? Unlike other facial oils, rose hip oil is lightweight and absorbs easily so it won’t leave behind a greasy residue. It contains small molecules that soak into skin and quickly deliver antioxidants. Because of this, skin can look plumper, smoother, and hydrated almost immediately. Since it’s chock full of vitamins with more than just anti-aging benefits, rose hip oil may be what your beauty routine is missing. If slathering oil all over your face makes you cringe, try adding a few drops of pure rose hip oil to your regular moisturizer for an extra boost of hydration. Or apply it alone to your face and neck in the morning to protect skin from sun damage, and before bed to help repair skin (no need to worry about greasy pillows since it absorbs quickly). While it protects against sun damage, rose hip oil does not prevent sunburn, so don’t forget to wear a moisturizer with SPF before heading outside. Besides facial oils, rose hip oil is also beneficial in eye creams, lip balms, and toners. If you suffer from irritated skin, try a rosewater toner to help regenerate and soothe skin. Thanks to its high content of essential fatty acids, rose hip oil has a short shelf life, so other oils are usually added in to extend its life. Pure rose hip extract will last about six months but it will keep for around two years with the addition of vitamin E or other oils. Keep it in a cool, dark place and throw it out once it turns rancid (the aroma will change to be more musty and acidic). Rose hip oil is a relatively inexpensive way to hydrate skin and make it look younger. Give it a try if you’re looking for a natural anti-aging topical. is it possible for you to suggest where to buy this oil. Most large cosmetic stores carry rose hip oil. Thanks. my companion has had terrible itchy skin breakouts on his chest, from time to time. We,ll try your suggestion. Happy holiday. Hope it works for your companion. Happy holidays to you both!